This discussion paper comes out of a preliminary discussion held with our PCC to consider whether we as a parish are willing to embrace a more open policy in regard to Holy Communion. After discussion the committee were content for the subject to be considered by the whole church family. At present we uphold the long held practice that admission to Holy Communion follows after confirmation. However in our changing society I believe that position is becoming increasingly untenable and we need to think about change. That thinking about change should be underpinned by two principles. Firstly, that this is a decision which we believe to be the right regardless of the circumstances. And so whilst seeking to meet the needs of our times may be the prompt, a more open policy for Holy Communion is simply the right thing to do. I believe that because of how I understand baptism. Baptism marks a beginning of a journey with Christ for through it we are buried with him in his death but also share in his resurrection. Consequently sharing in his life must mean being able to receive him through the sacrament of Holy Communion. Our practice seems to suggest that baptism is somehow inadequate and incomplete which cannot be true. Secondly, it is a decision that is both pastoral and evangelistic. The Church of England has seen confirmation historically at least, as a pastoral (as well as a sacrament) tool through which the Bishop can maintain contact with the parishes under their care. However things are changing, no longer is confirmation a rite of passage for our young people as it once was. At St. Mary’s we are lucky in that people of all ages come and explore their faith with us. We need to ask what message excluding them from Holy Communion sends. On the one hand whilst it is right and proper that we prepare properly for Holy Communion we must also never lose sight of the power of the sacrament to convert people. To use slightly more emotive language I cannot believe that Jesus would exclude anyone from sharing in his life, nor should we, whether they are child or adult, what matters is their baptism and desire to draw near with faith. As a sacrament, it still has an important place in the life of the church. It is a means of grace and integral to the journey of faith and as we look to the future, teaching and nurture will have a greater importance in the life of the church. Consequently moments that recognise, honour and celebrate their journey, like confirmation become more important and meaningful rather than less. Please give this matter some thought and prayer over the coming weeks. I know that for some of you this change may seem wholly wrong but for others it makes perfect sense. We are not alone for this discussion is taking place across the church around the country. Do ask me any questions you may have. It’s easily missed but on the wall in our dining room is a small icon. It depicts the moment when having walked with Jesus along a dusty road to Emmaus the disciples finally recognise him when he breaks bread. All of us will have memories of being gathered around a table with family and friends and of being fed, not just with food, important though that is, but by the company. Meals often breakdown barriers between people. For example whenever I’m at a conference it is often at meal times when the most enriching conversations can take place. Jesus knew this when he and his disciples gathered together in an upstairs room on the night before he died. He knew too, probably from his own experience that time spent together around a table eating and drinking were special times. Looking ahead he knew too that the meal began in that room would have an enduring quality that it would sustain his followers in the years to come. Indeed we know that soon after Christ’s ascension, his followers gathered around the table to break bread and be together. All these years on nothing much has changed. It is the table where all are welcome, it’s just that our practice doesn’t really reflect that. This month a leaflet will be available which sets out some of the reasons why I believe it is time to change our long adhered to practice that means to share in this bread and wine you must be confirmed. I am not going to repeat those words here but simply invite and encourage you to make some time to consider the leaflet, ask questions of me and discuss it with each other. To help our thinking I am thankful that Andrew Shanks (sometime Canon Theologian at Manchester Cathedral) has given us permission to use a chapter from his book Anglicanism Reimagined. This is available below to all who would like to read more on this subject. Lastly do feel able to come to a forum on Sunday 18th September at Church at 12 noon, a time for questions and discussion, after then the PCC will decide whether it is the right time for us to make this important change to assist us in making St. Mary’s a place ‘where all find a welcome and are nurtured in their journey with Christ’. The truth of faith may be said to be an ideal exposure to a certain sort of Questioning. Namely: God questioning us, opening us up to the moral reality of our lives. A true church would be one which truly transmitted that questioning. But what sort of demands will such a church make upon its members, as such? I grew up in a Church of England culture where church membership was largely equated with a not very demanding sort of respectability. But, again, what does the Questioning in question do to conventional notions of respectability, that is, herd-morality notions of ‘good and evil’? It dissolves their authority. Faith, as an exposure to the Questioning of God, sweeps away the rival pretensions of any religious respectability-code directly to embody the highest ideal. So Paul, the first Christian theologian, subordinates ‘law’, meaning religion as respectability-code, to ‘grace’, the working of faith. ‘What then?’ he asks. ‘Should we sin because we are not under law but under grace? By no means!’ (Romans 6: 15) It isn’t that faith necessarily means repudiating the dictates of respectability. Paul’s no lover of scandal, for the mere thrill’s sake. Nevertheless, faith, as he understands it, does at any rate mean entertaining the possibility that, in some ways, respectability’s notion of ‘sin’ may itself be a notion infected with sin. The first Christians opted for faith against respectability: Jews repudiating Jewish respectability, Gentiles repudiating Gentile respectability. In the Pastoral Epistles we can see a new respectability-code arising, this time a Christian one. But that’s a later development. Writing to the church in Rome, Paul’s simply intent on carving out new space for faith-as- Questioning, with Christ, representing God, as Questioner. Nor does this principle only apply to the maximum of church membership, the higher levels of sanctity. It also applies to the minimum. True sanctity isn’t just a maximum of ultra-respectability, conventional morality topped up with extra turbo-charged energy. And no one, either, is properly excluded from full membership of the church because they fail to meet some basic minimum respectability requirement. This, I take it, is why we baptise infants. Thus, to be respectable is to know how to behave – respectability, in that sense, is the opposite of being infantile. But how then are the earnest advocates of Christian respectability to make sense of what Jesus says? ‘Let the little children come to me; do not stop them … Truly I tell you, whoever does not receive the kingdom of God as a little child will never enter it’ (Mark 10: 14—15). The grace of faith, it seems, clears away the adult self preoccupied with respectability. It does so to make room for another, quite different sort of adult self, one that’s still opened up to fresh moral insight the way a child is. Namely: the devotee of faith-as-Questioning. One who’s capable of looking beyond the demands of respectability, to the altogether more troubling, because not yet codified, not yet learnt, demands of perfect justice, perfect love. In general, whenever the church incorporates new members into itself, through the ritual of baptism, this is an occasion for it, symbolically, to represent itself to itself. 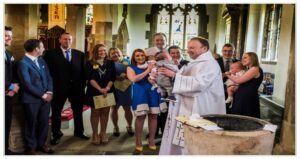 And when, in particular, we baptise infants, then by that very act we’re affirming that the church is something altogether more than just a project for reinforcing standard adult roles. Far rather, it suggests, the church is meant to be the creation of an open conversation space: a space for simple Honesty, in the ‘broken middle’, where the false protection offered by respectability has broken down. The baptised infant, not yet socialised, represents the future chance of unpredictable fresh stirrings of the Holy Spirit – all kinds of fresh insight – who knows what? And as it welcomes its new member, the church, in principle, also welcomes that chance. And yet, then – look: we’ve messed it up! For, surely, the authentic sacramental power of infant baptism lies in its representing full admission into church membership. Everything here, in symbolic terms, depends upon the child’s inaugurated membership in the church being both unconditional and complete. However, it turns out that (whatever we may say to the contrary) in actual Church of England practice the baptised infant is no more than a half-member of the church. The way we’ve organised things, you only become a full member when – at some later age, and after some sort of training – you’re confirmed, by the laying-on of a bishop’s hands. Baptism, our tradition insists, needs to be ‘completed’ by confirmation, and until that’s happened, still in most Church of England churches (although thank God things are in fact now beginning to change) you’re not entitled to receive the bread and wine of the eucharist. That’s to say, when it comes to the primary symbolic act that signifies ongoing church membership, you remain symbolically excluded. The training required for confirmation may be pretty perfunctory, but even so the symbolic message is clear enough. Full membership is conditional on that training. After all, what baptism represents here is no unconditional offer of full belonging, to reflect the unconditional gift of divine love. And, hence, it can scarcely be said to be a pure showing-forth of ‘grace’. Instead, it’s become a promissory work of ‘law’. The sheer generosity of its underlying sacramental truth has been overlaid with anxious ecclesiastical nagging: ‘Godparents, this is your duty, baptism ought to lead to confirmation, don’t forget…’ And the authentic testimony of faith begins to disappear into that nagging. I think that the separation of first communion from baptism is, and always has been, a quite basic theological mistake. And not just an accidental mistake, either – but a highly revealing one. This is no mere quirk of liturgical history. On the contrary, its malign symbolic significance runs deep. Martin Luther in his day launched a great onslaught on respectability-code religion, invoking the authority of Paul against it, and setting out to establish a whole new church on that basis. In the process, he repudiated the old mediaeval rite of confirmation. Nor did he personally want to replace it. But (alas!) the Reformation wasn’t only an onslaught on respectability-religion. It was also a movement harnessing the pride of the literate laity – quite a different matter – and Luther, therefore, still didn’t think it symbolically appropriate to admit children to communion without, first, putting them through a good bit of compulsory book learning, so as to make the point. Therefore, he produced his own Catechism for that purpose. And then, in 1538, his colleague Martin Bucer drafted a scheme of Lutheran church order for the state of Hesse, which did include a new confirmation rite. One way or another, all the most notable Reformers who subsequently, like Luther, continued to practise infant baptism, followed Bucer’s lead. Including, despite some initial misgivings, the Anglicans. But, in opposition to the Old Reformation, the New Reformation I advocate would involve a complete break from the practice. The Eastern Orthodox churches manage perfectly well without it. For them, infant baptism, confirmation (or rather ‘chrismation’, the ancient rite of anointing with oil that in the West evolved into confirmation) and first communion are typically three parts of one and the same liturgical event. And, whilst it may be more by accident than design, it seems to me that, so far as this goes, the Orthodox have got it right. A ritual celebration of wisdom? But surely – it will of course be objected – we do need some sort of rite in which those baptised as infants can, once they’re old enough, positively own their membership in the church for themselves. Don’t we? Yes, we do. Only, what sort of ‘owning’ is required? What counts as ‘old enough’, for this purpose? And why on earth should having been through such a ritual be made a precondition for sharing in the eucharist? Suppose one was starting from scratch to devise an ideal regime of Christian initiation: on the one hand, I think that the liturgy needs to communicate the absolutely unconditional nature of divine love. But, on the other hand, it also needs to communicate the infinitely restless proper orientation of faith towards the deepest wisdom. Both principles are vital; there’s a basic requirement of balance here. In general – one might say – the progress of Truth is partly the work of isothymia, that’s to say, people’s insistence on being recognised as the innate equal, in dignity, of other people, their sheer refusal therefore to be put down and silenced. And partly it’s the work of megalothymia, people’s ambition to be acknowledged in their achieved uniqueness, for the special insights that are distinctively theirs.1 Baptism as a sacrament, especially the baptism of infants, and the eucharist as a sacrament are both of them, first and foremost, rituals of holy isothymia. In other words, they symbolically enact the underlying equality of all God’s children. However (I agree) we do also need encouraging rituals of holy megalothymia, to balance them. My objection to the traditional Church of England rite of confirmation, and to other such rites in other churches, is simply that they’re so inadequate for that purpose. The point is this. A celebration of holy megalothymia would, in essence, be an invitation for each individual to consider his, or her, own God-given vocation in life, as something altogether more than just a matter of conventional role-play. It would be, precisely, the expression of a much deeper form of respect, for each individual’s mature individuality, than the ordinary respect we accord to ‘respectability’. Not everyone has a dramatic, world-shaking vocation. But every adult has a vocation of some sort, to be set over against the mere passive drift of herd-morality – as also against the glamorous allure of the gang, or the mindless excitement of the mob. A celebration of holy megalothymia would, in the first instance, be an act of resistance against the mentalities of the mob, the gang, and the herd. How, though, can we at all seriously honour an individual vocation, in this sense, until it has, quite clearly, emerged? Every infant may also be said to have an individual vocation, hidden in the future; every adolescent may be said to have an individual vocation, just beginning to peep out. But it’s only when one’s become an adult that the actual shape of one’s vocation begins to become truly visible – that’s what ‘adulthood’, as a moral category, means. I agree: if we’re going to baptise infants, then we do need some sort of ritual supplement to baptism, in order also, concretely, to reflect upon what one might call the vocational implications of faith, towards which the liturgy of infant baptism can only gesture in the abstract. However, this is no argument for the traditional rite of confirmation! The traditional rite mostly involves the wrong age group. If we were serious about wanting to celebrate the proper owning of faith – and if it were indeed faith we had in mind, and not just a simple conformity to one’s parent’s wishes, or to peer-group pressure – then I don’t think we’d have ended up with a rite like this. Not with one chiefly intended for young adolescents, and only for adults if, for some reason, they’ve missed out in adolescence. The Baptists charge us with trivialising faith: failing to express, through our initiation rites, its full counter-cultural thrust. I think they’re largely right. In abandoning infant baptism, it seems to me that they’ve given up the classic liturgical expression of half the truth; but at least their system does make good consistent sense, according to the other half. The baptism of adults is far more likely than the confirmation of adolescents to represent a serious act of commitment. We by contrast, having traditionally made confirmation the gateway to first communion, have forever been impelled to lower the minimum age for confirmation because we’ve been embarrassed about excluding devout youngsters from communion. And the lower the age creeps, the less meaningful the rite becomes. We’ve excluded young children from communion on the grounds that they lack the necessary ‘understanding’. In my view, one of the most important things to understand about communion is that ‘understanding’ isn’t a necessary prerequisite for meaningful participation. But then it’s suggested that young adolescents, or older children, can understand, in the operative sense. And so – what exactly is this crucial element of understanding that one’s supposed to attain, more or less, around the age of puberty? For my part, I was confirmed and received my first communion at the age of fourteen. As it happens, I was a rather unusually devout teenager. One day I’d come across the word ‘mysticism’ in a book, and asked my parents what it meant. My mother pointed me towards Evelyn Underhill’s classic work on the subject, and I found it inspiring.2 Here, I felt, was true seriousness! I thought that maybe I’d grow up to become a monk. And I took to searching through second-hand bookshops for the great writings of the Christian mystical tradition, as identified by Evelyn Underhill in the historical appendix to her study. Before long I had quite a collection. I practised contemplative prayer; adolescent megalothymia blazed within me, in the most sanctified form. You might well think that for such a child confirmation would have been a big deal. Yet, it wasn’t. The preparation course was conscientiously run, warm, humorous. I remember that. Nevertheless, the fact is that when I search my memory today the whole actual ceremony itself has vanished. Doubtless it was an event of great mediaeval splendour, shafts of sunlight falling through the stained glass windows, organ music crashing and surging around soft moments of stillness. So I imagine. But no – nothing at all! I’m afraid it didn’t register. I was too young. In retrospect it seems clear to me that, for all my reading and inner turmoil, I didn’t yet have enough to bring to the event, that was all of my own, to make it a truly meaningful moment of lifelong commitment. Confirmation, of course, is meant to be an occasion for those who were baptised as infants to reiterate, this time for themselves, the vows that were originally made on their behalf by their godparents; there are, however, other ways of doing this. The Methodist ‘Covenant Service’, for instance – whole congregations, as such, annually renewing their baptismal vows – seems to me an admirable practice. Also, I’m very much in favour of services in which those who, as adults, have returned to church membership after years out of it would rededicate themselves, with a renewal of their baptismal vows. That might well be made a memorable event. Or why not a renewal of baptismal vow in the context of a service in which those who’ve recently retired from work dedicate themselves to a new, more intensive phase in their church membership? I don’t know what such a liturgy would look like. But a dedication-rite for the truly mature, like this, would clearly go far more with the grain of 21st century human nature than the traditional rite of confirmation does. The traditional rite has youngsters making what’s theoretically supposed to be a solemn act of commitment to the church at the very moment in their lives when nature starts to prompt rebellion. Very soon they’ll (quite rightly) want to assert their independence from the adults who shepherded them to the altar. And here, of course, is an immediate opportunity for them to do so. All too often in practice the great symbolic act of becoming a full member of the church has virtually become a passing out parade for teenagers, their moment of departure from the community that they’ve this very moment joined. Oughtn’t we perhaps to take their disappearance as a bit of a divine hint? If however, by contrast, we were to focus instead on celebrating the moment in people’s lives when they come to retire, then we’d be encouraging the age group that’s the most likely to rejoin the church, or intensify their membership, anyway. And here moreover, in a secular world obsessed with the glamour of glamorous youth, would be a prime counter-cultural opportunity to reaffirm the wisdom of age! Why, indeed, as a matter of anthropological fact, has it always seemed so self-evident to previous generations that we needed an ecclesiastical initiation rite for young adolescents? Surely, it’s all about the internalisation of what Paul calls ‘law’ (not ‘grace’). Thus, this is the age at which youngsters first begin to become fully capable of internalising the rules of moral convention, no longer following those rules only out of fear of punishment or hope of reward, but out of inner conviction. Therefore in tribal cultures of every kind the boys especially are put through, sometimes, quite stern tests of pluck and endurance, to mark their transition to the privileges of adulthood. Confirmation is, in effect, a Christian equivalent to such initiation rites. To be sure, it’s always been a most half-hearted one – really very feeble by comparison with some! – but it has the same basic rationale. I don’t observe that, as a rite for adolescents, it has much serious connection with faith-as-Questioning. At that age, the Questioning proper to faith, if it surfaces at all, is nothing but a faint intimation of amorphous dismay; it hasn’t yet acquired the necessary lineaments and clarity, the moulding of experience, to be incorporated into meaningful liturgy. And, therefore, the confirmation of adolescents is certainly no proper celebration of holy megalothymia. On the contrary, what it’s designed to celebrate is nothing other than the polar opposite: the most conventional sort of respectability-code religion, masquerading as ‘faith’. It’s initiation into the church-as-tribe. The whole burden of Paul’s urgent message in Romans and Galatians is that faith, true Christian faith, is essentially an experience of liberation from this general species of religion. We mean to honour Paul, the great apostle. Actions, however, speak louder than words. The traditional rite of confirmation evokes a spirit in the church that’s, in actual practice, quite anti-Pauline. And it’s an intrinsically rather stuffy spirit. By no means all those who preach at confirmation services are pompous or patronising, but it takes a special talent not to be. The occasion itself so invites it. Shouldn’t we welcome any opportunity that’s given us to communicate the gospel to people in their formative years, so that at any rate they have something, one day, to come back to? Better blank ignorance, I’m inclined to think, than such a trivialising of the matter. The traditional rite of confirmation gives such false prominence to what inevitably tends to be such a very low level of existential understanding. Confirmation training, for adolescents, can’t help but tend to convey the message that gospel truth, what the church most cares about, is very like the content of a school lesson, only without an exam: not something, therefore, to be taken all that seriously. What’s wanted, to supplement the holy isothymia of infant baptism, are balancing rituals of holy megalothymia: a celebratory encouragement of the proper Christian quest for wisdom. Not conformity to any conventions of ‘law’, but wisdom: the sort of wisdom that belongs to the fulfilment of faith, wisdom as an opening to ‘grace’. Such wisdom has nothing to do with cleverness. Nor is it a mere accumulation of book learning. Rather, it surely has everything to do with one’s becoming aware of one’s mortality. It comes with actually feeling, in the marrow of one’s bones, that one’s going to die – as that sobering awareness summons up the challenge of God’s Questioning. Of course, there may be some twenty year-olds who are wiser than many a sixty-five year-old, even in this sense. But those twenty year-olds are liable to be a whole lot wiser yet by the time they reach retirement age. To go back to my initial question: what ought the church to demand of its members, as such? In my view, it’s very simple. ‘Think!’ the church needs to be saying. ‘Why are you as you are? Sooner or later death will come. And what will your life, then – in the end – have amounted to?’ It needs to focus all its attention on this one demand, to think. Otherwise, to escape nagging distraction, it needs to make as few demands as possible. But this one it needs to press home, decisively, with all the poetic resources it can muster. Let’s consider the historical background. I’d love to be able to point back to some golden age in which things were better ordered. But I don’t think there’s ever been a golden age. We’ve never had a set of initiation practices clearly and explicitly determined by the demands of an ideal commitment to truth-as-openness, alone. Instead, church practice, here, has always been a bit of a muddle. It’s unclear how far back in church history the practice of infant baptism goes: whether perhaps already, right from the beginning, when whole households were converted and baptised, the children were also included as a matter of course.3 Hard evidence only begins to emerge at the beginning of the 3rd century. Tertullian, writing in around the year 200, briefly discusses the matter; evidently infant baptism was a familiar practice at that time, but it’s unclear how prevalent. He, at any rate, deplores it. This is because Tertullian is an advocate of what one might call furious faith: for him, faith involves a fanatically unflinching confrontation with the pagan world. This is no child’s play – far better, he thinks, to keep innocent children out of it. (Tertullian has no notion of original sin, it’s clear to him that children are innocent.) Many in the persecuted churches of the 3rd century, however, drew different conclusions. These communities felt the need to guarantee their survival by implanting Christian identity, in the most decisive fashion, into the hearts and minds of their children. And to them, infant baptism signalled that intent. Hippolytus of Rome in his Apostolic Tradition (originally compiled some time between 200 and 220) clearly accepts the practice. Origen, a little later, firmly advocates it. And then Cyprian of Carthage, in the mid 3rd century, represents a North African church order that unequivocally required it, as the norm. During the 4th century however, after the conversion of Constantine, as the Roman Empire rapidly became Christianised, that original rationale disappeared. The church was able to relax. And at first, as a result, infant baptism appears largely to have been abandoned – other than when a child’s life was in danger. The commitment involved in baptism was so grave – sins committed afterwards were regarded as so much more grievous than before – that it seemed kinder, or more prudent, to defer it. St. Augustine was typical of his contemporaries: born in 354, the son of a devout Christian mother, and yet, himself, not baptised until he was 33. However, in his later years, as a bishop, Augustine also, crucially, represents the further shift of opinion that followed. In 410 Rome, for the first time in eight centuries, was overrun and sacked by an invading barbarian army, that of Alaric the Goth. The old secular order was starting to disintegrate. Senior churchmen, observing this, increasingly now came to see the church as the sole future guarantor of civilisation itself. Henceforth, infant baptism came to acquire another compelling rationale: now, as a symbol of the need for civilisation-preserving church order to be fully extended over the whole life of society, that’s to say, the life of all its members, from the cradle to the grave. Augustine, responding to this new rationale, became, as a bishop, a fierce advocate of the practice. As for the linkage between infant baptism and first communion: this, again, has fluctuated. Origen, writing in c. 235, makes it clear that in Palestine, and probably also in his native Egypt, there was a certain interval fixed between the two. Cyprian, however, a few years later, indicates that in North Africa all the baptised, including infants, were admitted to communion.5 And it appears that it was the North African pattern that, at first, tended to prevail, everywhere, following the general revival of infant baptism in the 5th century. Confirmation, as a separate rite from baptism, requiring a bishop, began to evolve in the West from the 5th century onwards. At all events the first use of the Latin term ‘confirmatio’, with this meaning, and the first attempt to provide a theological rationale for it, are to be found in a Whitsunday sermon by Bishop Faustus of Riez, in southern Gaul, some time around the year 460.6 The original reason for the coming apart of the two rites was the difficulty that bishops had in getting round the remoter regions of their dioceses: one might have to wait years before the bishop was there to perform the confirmation. There was no such coming apart in the East because, in the Eastern Church, ‘chrismation’ didn’t have to be performed by a bishop. Even today the practice of confirmation isn’t always dysfunctional. My argument is that it’s a fundamental theological error to envisage adolescent confirmation as the primary supplement to infant baptism, or the gateway to communion. But, in sub-theological terms, the institution, interpreted that way, works quite admirably, for instance, in Finland. Although the general rate of actual churchgoing in Finland is rather low, confirmation remains a major rite of passage for around 90% of all 15 year-old Finns each year. Most nowadays join summer confirmation-training camps, in the woods or on the shores of lakes. More than a third of them then go on to participate in the Young Confirmed Voluntary Workers scheme; many 16 and 17 year-olds become group leaders for the confirmation-training camps of the next two cohorts. And the actual confirmation service is a highly charged civil-religious event, for the whole community. However, its power clearly lies in its civil-religious character. One can’t help but think that it’s much more about initiation into being Finnish than about initiation into being Christian. Better perhaps than any other, the Finnish church thus fulfils the purpose that Henry VIII, at the beginning, had in mind for the Church of England: to be the religious agency of national unity. There’s much to admire in Finnishness. To my mind, one of the hallmarks of a morally sound political culture is people’s willingness, in principle, to pay high taxes. The Finns are happy to pay, by British standards, fantastically high taxes – and furthermore it seems to have done their economy a power of good. This willingness to pay high taxes derives from the fact that they feel, it seems, so much more strongly than the British do: ‘We’re all in this together’. And that’s also what they’re affirming when they gather in church for the confirmation of the nation’s 15 year-olds. The outcome’s enviable. But, despite the church context, this sentiment of togetherness is surely more a consequence of ethnic homogeneity, and the sharing of a highly idiosyncratic language, than a product of shared Christian faith. Finnish is such a very distinctive, consensual and cosy identity. What we see here is essentially a celebration of the most successful sort of modern tribalism. And, in any case, there’s no way that we in our cosmopolitan, multiply fractured culture here in Britain, today, can ever hope to emulate the Finns. We Anglicans need to reinvent ourselves, but that isn’t a realistic option. When Henry VIII first decreed the separation of the Church of England from the Church of Rome, with himself as its ‘head’, what he wanted was, above all, an institution to provide religious back up to law and order. Confirmation in the Church of England has traditionally been the affirmation of two loyalties in one: loyalty to God, and loyalty to the law-and-order establishment. Once upon a time it was a common belief among the propertied classes that, unless the poor were restrained by the fear of hellfire, and encouraged by the promise of heaven, the likely outcome would be anarchy. But now we know better! Far more than the fear of hellfire, for this purpose, we simply need an efficient police, and far more than the promise of heaven, the tangible promises of economic growth. So experience has shown us. And, in principle at least, this discovery surely represents a great liberation for the church. At long last, I think, it sets us free from a mighty distraction, which has held us in thrall for far too long. The dysfunctional nature of the traditional Church of England baptism-and-confirmation regime, in the present context, is plain enough for all to see. For the most part we still haven’t thought about it very radically. 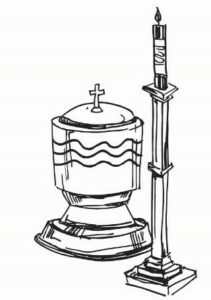 But the old order’s actually started to slip: in many parishes, now, Archbishop Peckham’s link between confirmation and first communion has, in fact, already been abandoned. The average age of those being confirmed is rising; much younger children are being admitted to communion, even if not, quite yet, immediately from the point of baptism. What’s made this new development, such as it is, possible? In the first place, I take it to be a sign that the church is tacitly giving up its old law-and-order interests: we’re no longer anything like as committed as we once were to instilling the fear of God into adolescents. Nor will they let us. Meanwhile, however, we’re altogether more serious than before about providing a real eucharistic welcome to young families, in their entirety. And, of course, it does frustrate us to see newly confirmed adolescents drifting away. In general, the old forms of Anglican respectability-code religion are being severely weakened. Things are thus moving in the right direction. All that’s presently needed, it seems to me, is a real theological push, as well, to speed the process on. These terms, ‘isothymia’ and ‘megalothymia’, are the original coinage of Francis Fukuyama, in The End of History and the Last Man. They come from the Greek. The prefix ‘iso-’ means ‘equal-’; ‘megalo-’ means ‘big-’. ‘Thymos’ may perhaps best be translated as ‘spiritedness’, with connotations of courage and self-esteem. In the Republic 435c—441c, Plato discusses ‘thymos’ as one of the three basic constituents of the soul, alongside reason and desire: it’s other than pure reason by virtue of its emotional fieriness, but it’s also other than simple desire in that it’s bound up with a moral self-image. Although I’m using the terms in a very positive sense here, it should perhaps be noted that ‘isothymia’ and ‘megalothymia’ are, in themselves, quite morally ambivalent categories. For ‘thymos’ isn’t only a form of energy in the service of truth; it’s also the natural element of all forms of idolatry, as such. (Idolatry of isothymia: the passions of the herd, governed by herd-morality. Idolatry of megalothymia: the passions of the tyrant, and of the tyrant’s allies, who govern the herd.) In short, it’s a name for that whole troubled aspect of the human soul which true religion seeks to redeem and purify. Evelyn Underhill, Mysticism, first published 1911, reissued Oxford: Oneworld, 1993. The evidence regarding the prevalence, or otherwise, of infant baptism in the first two centuries, and the subsequent development of the practice is thoroughly aired in the 1958—63 interchange between the two German scholars Joachim Jeremias and Kurt Aland. Jeremias argues that it was probably widespread from very early on, but Aland disputes this. See Jeremias, Infant Baptism in the First Four Centuries, English translation by David Cairns, Philadelphia: Westminster, 1960, and The Origins of Infant Baptism: A Further Reply to Kurt Aland, English translation by Dorothea M. Barton, Naperville: Allenson, 1963; Aland, Did the Early Church Baptize Infants? English translation by G. R. Beasley-Murray, Philadelphia: Westminster, 1963. For a more recent historical survey of the whole history of infant baptism, see David Wright, What Has Infant Baptism Done to Baptism? Carlisle: Paternoster Press, 2005. Among earlier theologians arguing in favour of infant baptism, Origen and Cyprian both, more or less, anticipate Augustine’s approach. The classic early expression of an alternative approach, not seeing infant baptism as a remedy for original sin at all, but nevertheless affirming it as a symbol of God’s covenant with the whole Christian family, is in fact John Chrysostom’s, in his Baptismal Instruction.